The Back Story: Utility ski boat classics like the head-turner that is Eagle’s Wings are not common. Rev. Michael Schneider, Eagle’s Wings owner, grew up in Northern California, where he first found an interest in water skiing, summer activities, and boating at Crystal Lake. Being a child of the 60s, Rev. Schneider felt a certain fondness for this style of Chris Craft showboat. One of the features that really attracted Rev. Schneider is the eye-catching wooden exterior, which comes off as an early ‘60s classic right away. Fond memories of water-skiing on Clear Lake prompted Rev. Schneider to purchase Eagle’s Wings. 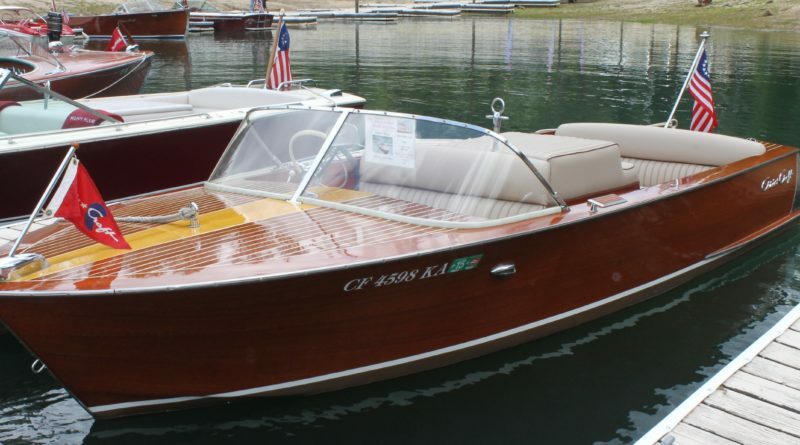 Another notable fact is that 1960 is the first year that Chris Craft manufactured this retro throwback — a 1960 Chris Craft Sport Ski. Proud of how “meticulously maintained” Eagle’s Wings has been, Rev. Schneider pointed out that she has new interior upholstery and Pyramid vinyl flooring with Berber carpet overlays. All the mahogany wood is original from the factory, and new switches have been installed on the dashboard to operate the bilge pump and vent blower. With a fiberglass bottom recently repainted in the original copper/bronze color, Eagle’s Wings does not require to soak in the water to expand planks before use. In line with the times of fast cars and drag racing, Eagle’s Wings is powered by a 283 Corvette marine engine with 185 horsepower. She’s a real beauty — and a fast one — racing on the water. For traveling to water and show destinations, Eagle’s Wings goes in style with her upgraded burgundy towing trailer, which has LED lighting and chrome wheels. At boat shows embroidered burgundy towels complement her matching fenders, tie ropes and dock placard. Notable shows: Eagle’s Wings has built quite the reputation as being a perfectly preserved slice of boating history. In September 2016 at Lake Tahoe, Eagle’s Wings was shown as the 41st annual International Antique & Classic Boat Society Show and received a Silver Award for “Best Preserved” in the utility category.